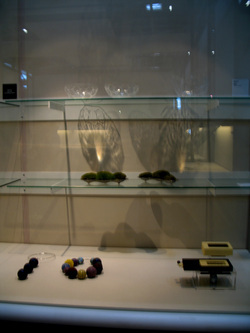 As an artist, I would like to express of my art works as an exceptional visual. My art work is based on an unlooked for change. 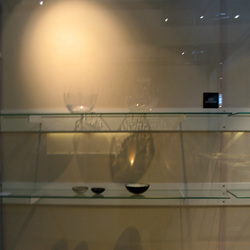 As soon as you touch this bowls and even the wind blowing, you could be able to recognize light and free. I think that it shows the most Authentic appearance of Artist work when it used. So I have interested in the flexible material to move freely. Therefore, I have started to make this work with silicone. The reason I choose the silicone as a material of my work is that it looks a piece of glass when it doesn't have any motion. But it has a trick. If you touch the bowl, you could find out it doesn't looks a glass any more. I made thin layer of silicone to be moved freely. But thin silicone board is too weak to keep form. So, I put stainless steel wire into the silicone board to get some pillar for stand up by itself. And the wire -get out from the silicone- is can make more free movement. Also, I have made separate pieces of silicone to inject the color. And I have cut the solid pieces of silicone to make specific shape of thin layer silicone. In addition, the significant of my works are free in movement, spontaneous shape and flexibility. Also I think it could always compare with the past, and is looking forward to seeing unknown future. I like tricks between the real world and the surreal world, and an unexpected effects. 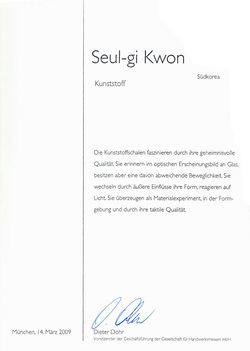 국제 공예 박람회(Die Internationale Handwerkmesse Muenchen) 기획 전시인 ‘탈렌테(Talente)’는 세계 각 국의 만30세 미만의 젊은 공예가, 디자이너들이 초대되는 중요하고 흥미로운 전시 중의 하나로 알려져 있으며, 작가, 디자이너로서의 시작에 있어서 중요한 경력으로서 의미를 가진다. 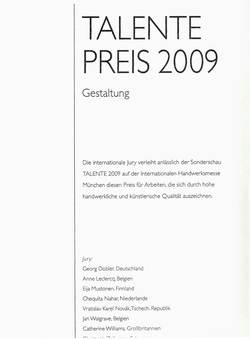 매년 참가자들 중에서 약 8명의 Talente Prize를 수여하고 있는데, 탈렌테 2009에서 권슬기(국민대 대학원)양이 한국작가로서는 처음으로 본상을 수상하는 영광을 가졌다.